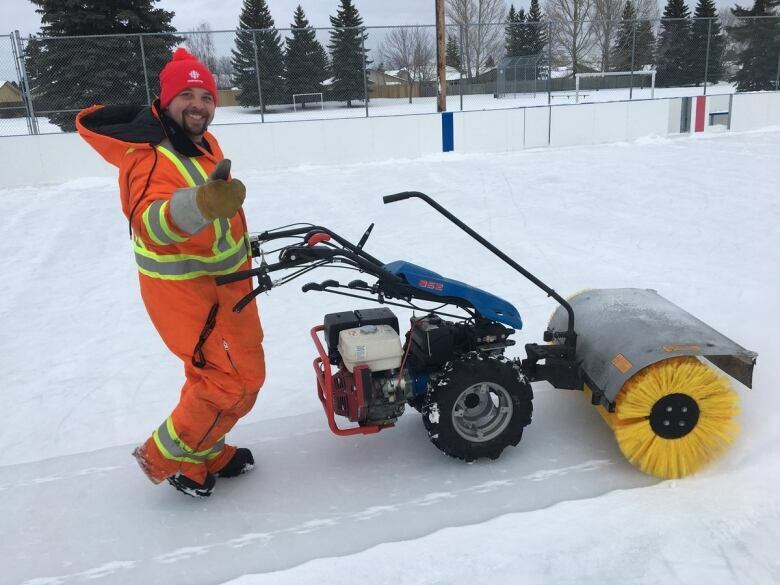 Impervious to the bone-chilling temperatures, a legion of dedicated volunteers trade in their free time to maintain Edmonton’s community rinks. Impervious to the bone-chilling temperatures, dedicated volunteers trade in their free time to maintain Edmonton's community rinks. The ice surfaces are cornerstones of city neighbourhoods in winter, giving throngs of Edmontonians a chance to lace up their skates. 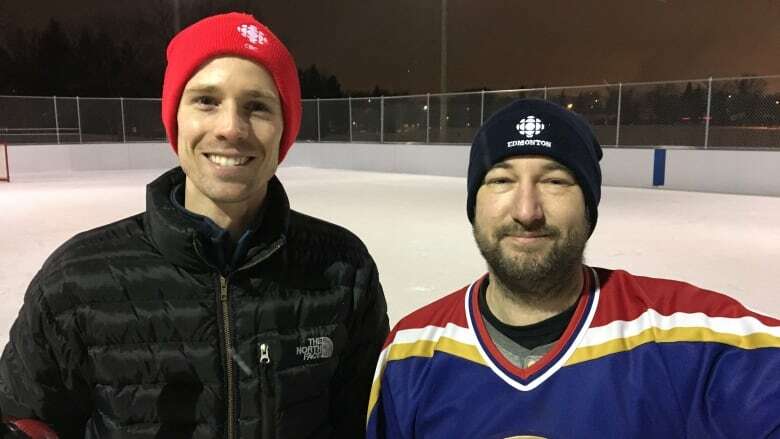 As we head into the final half of winter, CBC Radio's Edmonton AM is introducing a new weekly segment, in which we'll showcase the city's best rinks and the volunteers who maintain them. Host Mark Connolly will visit a different community rink and find out what it takes to keep the ice — and operations — smooth. Helen Gillespie is no stranger to hard work on the ice. For decades, she served as the master ice maker at the Strathcona Community League rink. She and her husband, Reginald, have been involved with the community league for 46 years, and were instrumental in getting the new hall built. Gillespie began her icy gig decades ago, when the rink's longtime "iceman" decided he didn't want to work during the busy weekend shifts. "That's when, silly me, I put my hand up and said, 'I'll give it a try,' " Gillespie recalled in a rinkside interview. At the time, she had no experience as an ice maker. Even so — with her husband and young children helping to wrangle the hose, snow-blower and scraping tools — she found the work rewarding. "I thought it was just pouring water on the ground, for starters, but it takes more than that," Gillespie said. "My whole family helped in prepping the ice at the beginning. "As cold as it would get, it was still fun because you would be dressed for it and we would laugh about it." Within "no time at all," she started to get compliments on the quality of ice and earned some dedicated fans in the neighbourhood. She continued maintaining the ice every winter until four years ago, when the work was contracted out. "I was really wanting to make good ice for the kids," she said. "They used to stand around the boards and yell, 'When is it going to be ready?' with these big eyes and big smiles. It was nice. "They used to come and say, 'This is best ice we have in the city' and I would think, whoa, way to go." Randy Layetzke has been making the ice at the Meadowlark community rinks for more than 30 years, but when his hip needed replacing, he needed replacing too. Student Mark Selwood stepped up to the challenge, heading to the rinks at 159th Street and 92nd Avenue after class to flood, clear and learn the finer points of ice-making under Layetzke's guidance. "I just always assumed you put water on it and it's done," Selwood told CBC Radio's Edmonton AM. "But there's so many different ways to do it. And if you don't do it right, you mess up the ice and it takes forever to fix. "As much as it is putting water on top of frozen water, there's more detail to it." Last season, Layetzke informed the community league of his impending hip replacement just two weeks before the season was to open. He struggled through last year but said the pain was too much to carry on. Selwood heard about the search for a replacement and as someone who'd been hanging at the rink since age seven, he was keen to give it shot. Layetzke agreed to spend this winter teaching Selwood the tricks and how to deal with some of the challenges. "The weather conditions are just horrendous sometimes, especially now ... it's just one extreme to the other," he said. "When you get the rain, it just destroys the ice and you've got to flood it for days and days just to get it back to normal." For Layetzke, there's a sweet full circle as he passes Selwood the shovel and hose. "When I first started, the kids were 10, 11, 12 years old. They've gone, matured, gotten married, brought their kids and now their kids are coming back here," he said. "I've gone through a whole generation and that is really nice to see." For more than eight years, the rink boards in the north-side community of Baturyn offered a promise of outdoor winter skating — but there was one big problem. No ice, the result of the even deeper problem of no volunteers. "I was sick of driving by here all the time when I only live half a block away so I approached the league," recalls Wayne Raymond, who moved to Edmonton about four years ago. So Raymond stepped up to fill both voids. "I've never flooded a facility this big or done anything like this, it was kind of learn on the fly," says Raymond about his first year as an ice maker. "Luckily enough, I was able to get some volunteers to help me. And man, they've been an absolute godsend." Raymond estimates he and his team of volunteers put in about 140 hours each month at the rink at 172nd Avenue and 105th Street. There are actually two rinks on the site but only one was flooded this year. Raymond says he grew up in Wabamum and refers to the frozen lake as the "ODR" he and his buddies would take to when the arena wasn't open. "It's my labour of love. I had my son on the ice when he was two and the smile I seen on his face. I was like, 'I need to do that for everybody,'" he says. "The kids coming out here, you see their faces. It's worth every hour, every second." Volunteers with the Parkdale Cromdale Community League are taking a different approach to their skating rink. This is the first winter in three years that the community league, nestled between Commonwealth Stadium and the old Northlands Coliseum, will have a rink. They've faced drainage problems and a lack of volunteers to help maintain the rink. But after some convincing of volunteers and drainage repairs, the league opened their skating rink on Dec. 15th, with an opening so grand it earned them a "most creative rink opening" award. Drag queens led a storytime and skate with kids, and a harpist played for those who laced up and hit the ice. "It was a huge hit," Steven Townsend, the community league vice president, told Edmonton AM. "There's drag queen bingo so why not drag queens on ice?" They want people, not just league members, to feel welcome. The traditional flood lights found at many community rinks have been replaced by string lights and skate tags are not needed at their rink. "We just want people to come out," said Townsend. The community league maintains a second rink at Sheriff Robertson Park, on 111th Avenue and 81st Street. The Hairsine neighbourhood in east Edmonton has the distinction of having two rinks side-by-side, one dedicated to hockey, another for community and kid-friendly skates. Maintaining both ice surfaces requires long hours in the cold. The paid icemaker is at the rink every night, said Les Barker, vice-president of the Hairsine Community League. "He sometimes even sleeps here overnight just to get the water down and just get the few inches of base going," Barker said. Barker credits a small but mighty legion of volunteers for picking up the slack from their tiny staff. "We have some great volunteers so if the snow comes, a few of us live across the street so we'll just come over and grab the shovels and grab the sweeper and pitch in. "We have a good community here." Connolly visited the new community ice rink in the southeast Edmonton neighbourhood of Holyrood earlier this month. Andrew Ambrocichuk, the rink's facilities director, said running a rink comes with its challenges. "For me, it's time. It's time," Ambrocichuk said. "It's difficult because it eats time out of your regular workday." After more than a year of working with the city on planning and construction, the community league-run rink welcomed its first round of skaters last weekend. The facility will hosted its grand opening Saturday at 5 p.m.
"So far, people are excited. A lot of people were worried it wasn't going to be open this year," Ambrocichuk said. "We feel really good. We're about ready to celebrate here." Randall Frye, the rink co-ordinator for Holyrood, is feeling more laid back about the work ahead. "It takes time," he said with a chuckle. "Once the ice is here, it's not that bad, it runs itself." Frye knew how he wanted to celebrate the grand opening. "Fireworks. Some chili. Some libations." Tune in weekly for the latest edition of Edmonton AM's Rink Checker. If you would like Mark Connolly to visit your community, email us at edmontonam@cbc.ca with details of your rink story.